Recent presentation: aiskju:b @ Reaktorhalle, Munich, 9-10 February. "Enigmatically atmospheric as the Universe". Ingeborg Ruthe, Berliner Zeitung. 444 spherical loudspeakers hang on thin wire ropes in the empty hall of the Reaktorhalle in Munich. The speakers do not emit sound and light all at once, but sometimes eruptively from a centre, while at other times sounds meander through the room like a soft wave motion. Developed by Tim Otto Roth, the sound laboratory is based on data collected at IceCube, the neutrino observatory at the South Pole. 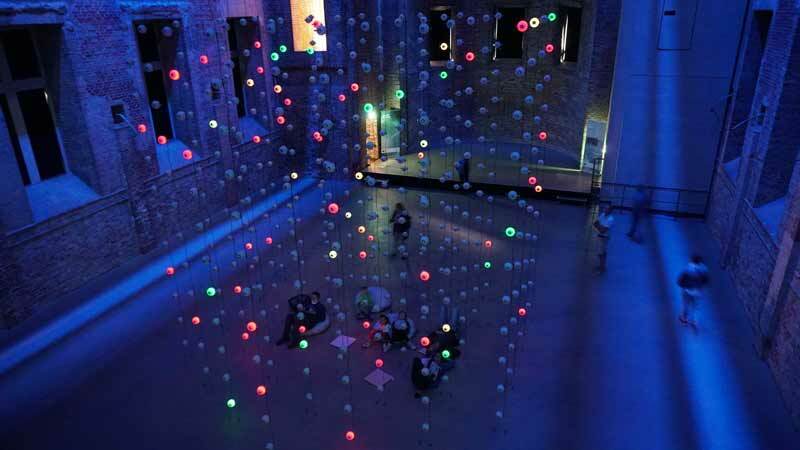 Visitors can move freely among the speakers hanging on 37 strings and thereby follow the movement of the "ghost particles" in the room. [aiskju:b] adopts the form and arrangement of the sensors in the Antarctic ice. 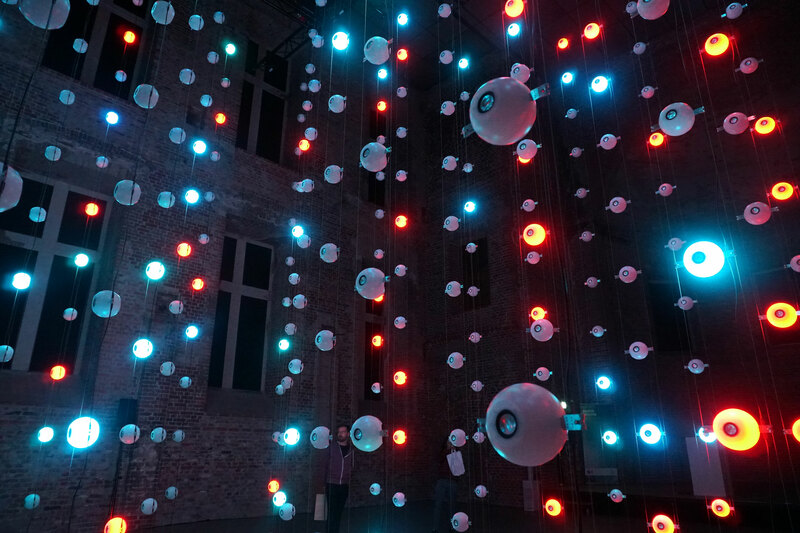 12 spherical loudspeakers hang on each of the 37 strings, creating a walk-in sound and light installation distributed over a volume of around 8m x 8m x 7m. Recent data from the IceCube experiment is fed into the installation, whereupon the measured energies are translated into coloured lights and sounds that fuse into different timbres, depending on one's position in the room. 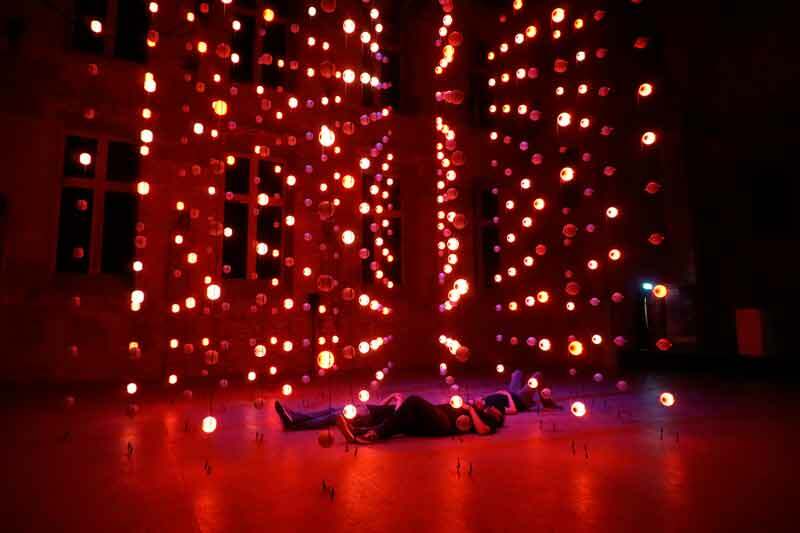 The goal is not only to provide both laypersons and scientists with a novel approach to physics research, but also to establish a new interdisciplinary art practice: AIS³ is at once an artwork and a fundamental experiment in psychoacoustics, turning the room itself into a sound generator in which the visitor becomes immersed. [aiskju:b] Review No. 1 is looking back to the premiere in St. Elisabeth, Berlin-Mitte in summer 2018. The 20 pages printed journal is available for free at the [aiskju:b] presentations. If you can't make it there, you can read individual pages as pdf here. 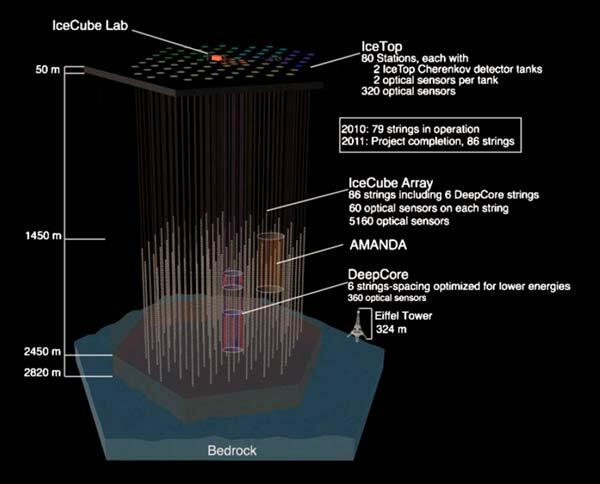 Visualization of IceCube detectors under the Antarctic ice. In fact, in the depths of the Antarctic ice shield ther spheres are in total darkness. 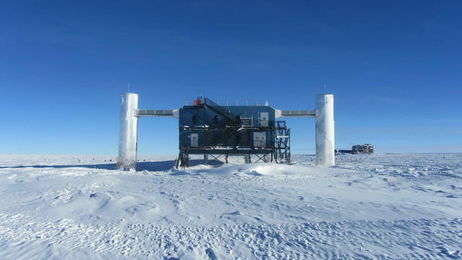 IceCube at the Southpole: From Antarctica the data are transferred via satellite to DESY in Zeuthen/Germany. 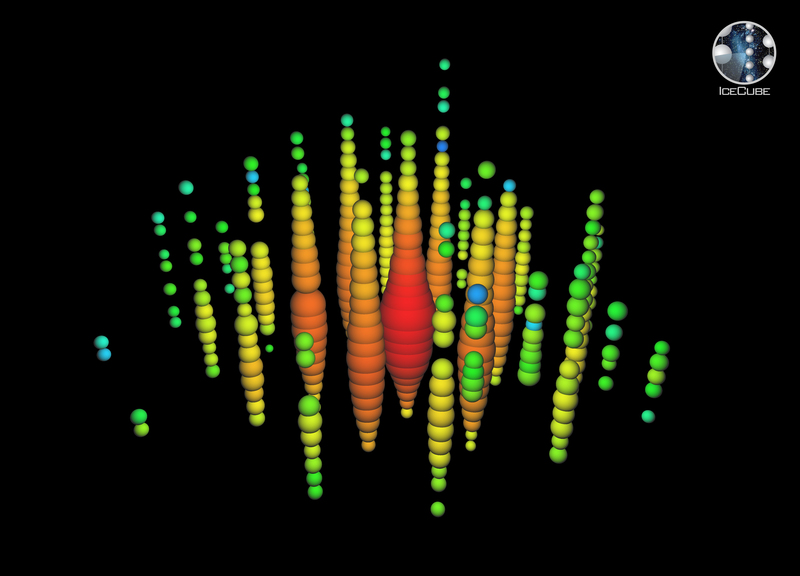 Visualization of a neutrino induced interaction in IceCube. 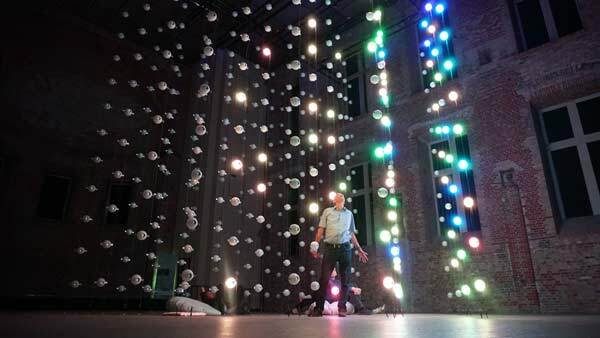 AIS³ not only makes a visual translation into flashing LEDs, but makes the spatial distribution of energies also audible via sine waves which recompose to specific sound signatures in space. Christian Spiering, former IceCube spokesman, and the artist and composer Tim Otto Roth in front of St. Elisabeth, Berlin-Mitte. 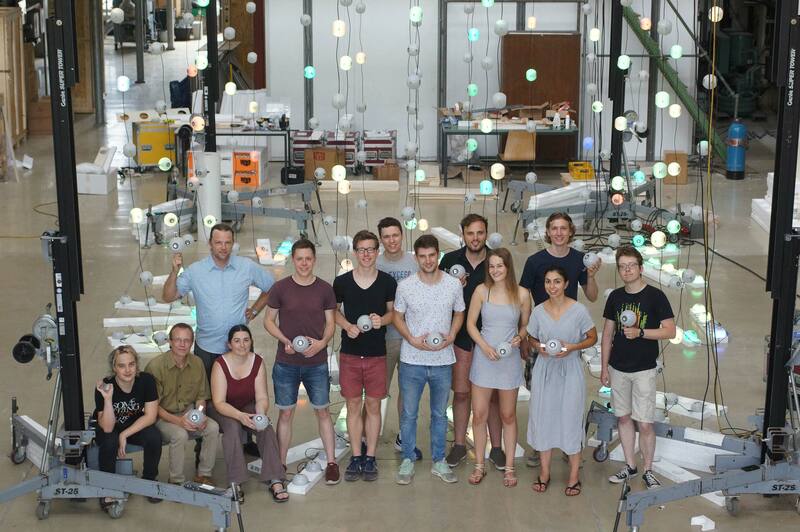 Setup team from RWTH Aachen. The project is on show in collaboration with SFB 1258 Neutrinos and Dark Matter in Astro- and Particle Physics on 9 & 10 February 2019 at Reaktorhalle in Munich/Germany. Further presentations will follow up in the Ludwig Forum Aachen and abroad. July 12, 2018: Neutrinos as messengers from a gigantic galaxy – another “falling wall”? 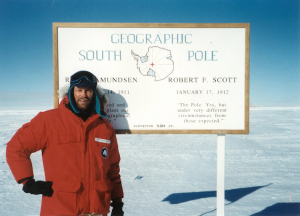 Christian Spiering, former spokesperson of IceCube, at the South Pole in 1996. Image courtesy of Christian Spiering. Four billion years ago, our solar system and Earth still in their infancy, a neutrino was emitted in our direction by a huge galaxy with a supermassive black hole in its center. It eventually arrived at Earth on Sept. 22 last year and was recorded by our IceCube neutrino telescope at the South Pole. The energy of the neutrino was extremely high – 45 times higher than that of protons in CERN’s Large Hadron Collider. Coincident with that event, gamma-ray astronomers observed that this galaxy (named TXS 0506+056) was in a high state of activity. The probability that this coincidence was just accidental came out as only 1:1000. A clear proof that this galaxy is a neutrino source? Not yet: sometimes even things with small probability must happen! The really thrilling story followed when we scanned through all the data taken since 2009. For a period of few months in late 2014/early 2015, we observed a clear excess of a dozen neutrino events from the direction of TXS 0506+056. And the chance probability for such an excess is only 1:5000! In my life, I have seen several walls falling, politically and scientifically. The fall of the Berlin wall in 1989 was clearly the most overwhelming event for me personally. It happened just one year after I had started working in the field of neutrino astronomy. Next came the discovery of a diffuse flux of high-energy extraterrestrial neutrinos with IceCube in 2013, named the “breakthrough of the year” by the journal Physics World. “Diffuse” means that the arrival directions seemed to be spread uniformly over the whole sky, with no preferred direction indicating an individual source. And now the first evidence for exactly such an individual source! Is this another “falling wall”? We don’t know yet for sure. The chance for such an observation just by accident is tiny, but it’s not below a millionth yet. This is the limit from where on the notoriously skeptical physicists call an observation confidently a “discovery”. Neutrino physicists need stamina. The next activity outbreak of a galaxy might be observed very soon – and possibly be recorded not only by IceCube but also by neutrino telescopes just under construction. And only then, eventually, we will know that a new branch of astronomy has been born! September 22, 2017 was just the exciting start. IceCube is the weirdest telescope in the world! Instead of light, X-rays, or radio waves, it detects neutrinos. Neutrinos are tiny, electrically neutral elementary particles that only interact with matter in extremely rare cases. For instance, 60 billion solar neutrinos reach each square centimetre of the earth's surface every second, but only a mere dozen react with the nucleus of an atom as they pass through the earth. However, these "ghost particles" provide us with unique information about the cosmos. Because of their low reactivity, they are capable of escaping even the densest cosmic objects, whereas light can only escape them indirectly. IceCube consists of 5160 light sensors that are frozen deep into the Antarctic ice shield at the South Pole, covering a full cubic kilometre of ice. The sensors register the tiny flashes of light that occur in the rare case of a neutrino interaction. On this basis, the direction and energy of the neutrinos can be determined. In 2013, the IceCube team managed to provide the first ever proof of high-energy cosmic neutrinos – a discovery celebrated as the breakthrough of the year by the journal Physics World. However, the directions from which the neutrinos arrived seemed to be distributed evenly across the sky: the IceCube researchers found no evidence of an individual source. This is exactly where the latest findings break new ground. 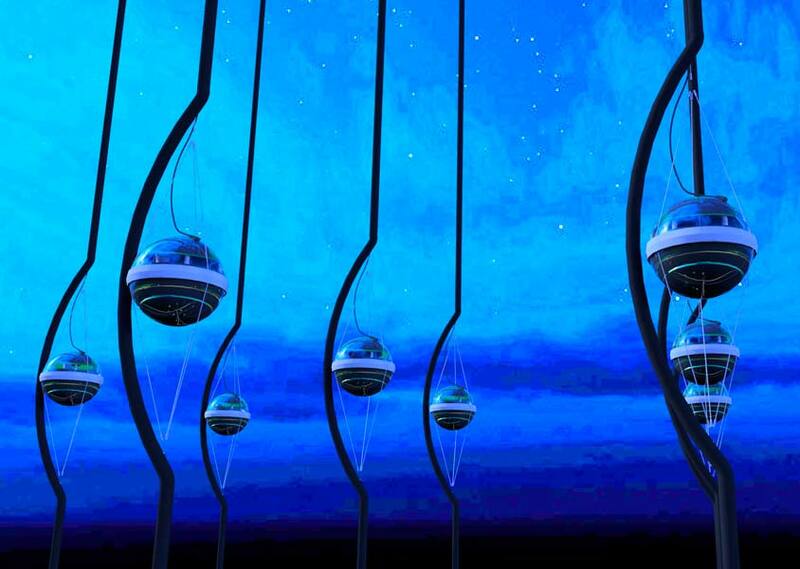 They are the first step to a precise cartography of the neutrino sky. Hence gravitational-wave astronomy, which won the Nobel prize in 2017, will in future be joined by neutrino astronomy as an important research field in physics. Tim Otto Roth's installation constitutes a sound space that be can be grasped as a form of land art expanding into the cosmic-acoustic realm: a hybrid between approaches such as Bernhard Leitner's research into the spatial motion of sound, and elements of land art such as those found for example in Walter de Maria's project Lightning Field. Visitors immerse themselves in a nature that is invisible, hardly tangible. As the motion of light signals measured at the South Pole research site is scaled down into a visual-acoustic representation, visitors become aware that they are subject to cosmic processes they usually do not perceive. Eventdisplay with he most energetic neutrino event propagating through the detector array. At the same time, the distribution of acoustic sources transforms the room into a synthesizer that blends tones into site-specific sounds depending on their duration and distance from each other. What is unique about AIS³ are the hundreds of acoustic sources installed in the room, offering an immersive corporeal experience that other procedures cannot equal. The simultaneous translation of pitch levels into coloured light guides listeners along a complementary path to a sound experience whose tonal elements could not be so accurately located by a merely acoustic approach. By this sonification the environment creates a new access to the data. The coexistence of light and sound makes apparent the major distance between a soundscape and pure optical representation. Vision can locate relatively well individual events in space, but the "bigger picture" and its simultaneousness can be perceived much better by audition. Last but not least, the sonification bears the potential for the scientist to experience his own experiment in a new way. The installation renders both selected data records by IceCube and live data transmitted from the Antarctic. When it comes to composition, the processing of IceCube data is informed by Tim Otto Roth's interest in the spatialisation of sound and in alternative physical scales that go beyond the twelve-tone system. IceCube lets different processes reveal themselves as cascading motions or spherical 'explosions.' The recorded energies are by no means arbitrary; they are related to one another in specific ways. These are weaved into physically determined micro-tonal sound movements in space – a Music of the Spheres for the 21st century. But AIS³ offers even more than a new access to scientific data. The 444 loudspeakers are physically distributed in the space. This allows an extraordinary sound space experience, which differs considerable from classic multi-channel systems of a cubic or hemispheric shape. Tones travel in space and recompose locally to different sounds. By this way each visitor experiences a unique sound space, which can be explored like an instrument by moving in. | admission free | How to get there. The exhibition is presented by the Sonderforschungsbereich 1258 Neutrinos und Dunkle Materie in der Astro- und Teilchenphysik at Technische Universität München. Tuesday, 28. August 2018, 7–9 p.m. The exhibition is accompanied by a series of lectures curated by the Deutsches Elektronen-Synchroton DESY in Zeuthen. In addition, leading experts from the sciences and humanities will gather for a tow-day symposium on September 14 and 15, 2018, to discuss the relationship of "Physics and Art(efact)." August 30, 2018, 7 p.m.
September 02, 2018, 5 p.m.
September 12, 2018, 7 p.m.
[aiskju:b] is the expression of a special liaison of physics and art. 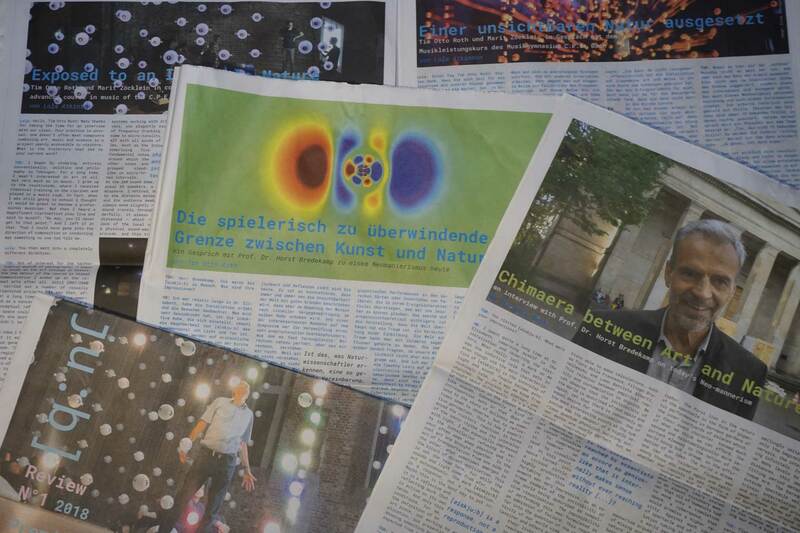 In occasion of the premiere in Berlin, a transdisciplinary symposium will take place asking for the relationship of artefact and nature and focusing implicitly upon the relation of the arts and physics (and its neighbouring disciplines). Here the symposium traces the physical dimension artists and scientists are confronted with – speaking the material and embodied quality of artistic and scientific experiments. Accepted speakers (talk & panel): Peter Bexte (professor of aesthetics, Academy of Media Arts Cologne), Charlotte Bigg (science historian, Centre Alexandre-Koyré Paris), Horst Bredekamp (professor for art history, HU Berlin), Wolfgang Ernst (professor for media archaeology, HU Berlin), Rolf-Dieter Heuer (vice president Deutsche Physikalische Gesellschaft, former CERN Director General), Heike Catherina Mertens (program director Hatje Cantz, former director Schering Foundation), Helga de la Motte-Haber (musicologist (em. 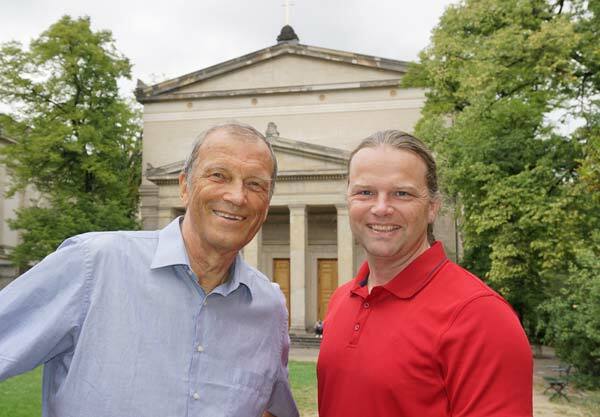 ), TU Berlin), Thomas Naumann (physicist, DESY), Hans-Peter Nollert (physicist, Univ. Tübingen), Christian Rauch (physicist, director State-Festival Berlin), Robin Santra (head of theory group Center for Free-Electron Laser Science, DESY), Gereon Sievernich (curator Hauptstadtkulturfonds and former director Martin-Gropius-Bau), Friedrich Steinle (Professor for History of Science & Technology, TU Berlin), Jol Thomson (artist & film maker, University of Westminster, London). 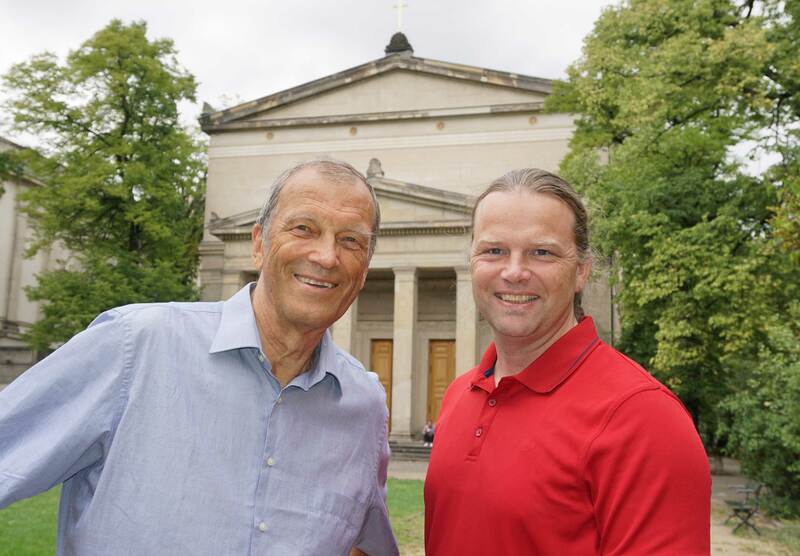 Guest of the day | Live interview with Jens Olesen in the TV programm "Der Tag" [engl. "The Day"] of the Deutsche Welle. 8. Januar 2019, Physics and Art(efacts), Tagungsbesprechung von Daniela Hönigsberg, arthist.net. For pictures in print quality please click on the correspondent pictures. You find captions and credits in the picture's meta code. Christian Spiering, former IceCube spokesman, and the artist and composer Tim Otto Roth in front of St. Elisabeth, Berlin-Mitte. Credit: Imachination Projects. Christian Spiering, former IceCube spokesman, enjoys [aiskju:b]. Credit: Imachination Projects. For IceCube related images see the DESY media database.